Taking care of essentials and suiting your active lifestyle, there's plenty of room inside the Canterbury Vaposhield Medium Sports Holdall in Navy. Easily opened by a pair of wraparound zips, the spacious main compartment comfortably looks after your kit with space for footwear, clothes, accessories and any other essentials. For smaller items you need easy access to, pockets over each end and one side are ideal for loose change, keys or mobile devices. 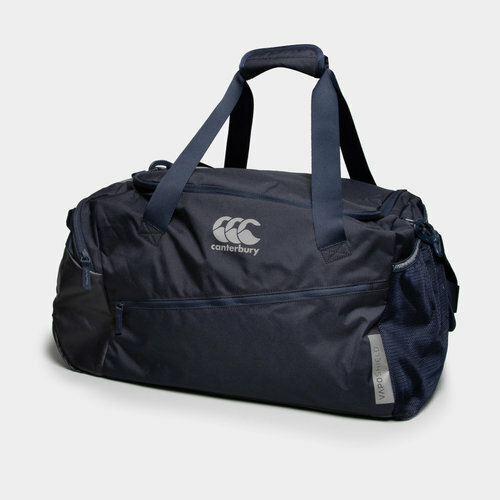 We all know that rugby players can come with lots of baggage but any kit is made light work of thanks to the padded and adjustable shoulder strap and adjoining carry handle. CCC have used VapoShield technology to produce a water-resistant sports bag. A water-resistant lower side laundry/footwear compartment allows you to separate muddy boots and kit away from your other training products, whilst an anti-scratch base limits wear and tear.